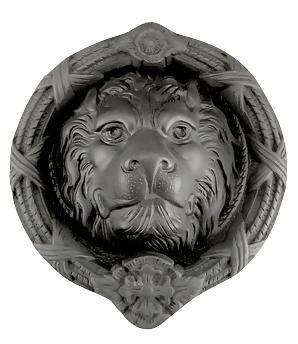 9 5/8 Inch (7 Inch c-c) Ribbon & Reed MGM Lion - Lost Wax Cast Door Knocker (Oil Rubbed Bronze Finish) - measures 9 5/8 Inches tall and 8 Inches wide with a projection of 2 3/4 Inch. Mounts in rear with two bolts. Mounts with two bolts in rear - 7 inches center to center. Highly detailed door knocker. The lost-wax casting process, sometimes known by the French name of cire perdue is an ancient practice that is still used for artwork today and it is used to preserve the fine details of the original highly-detailed components.